With so many mem­bers having been involved dir­ectly or indir­ectly in Sheffield’s indus­trial scene, there was a palp­able fris­son of expect­a­tion as our Chairman intro­duced this week’s speaker, Bryan Peters. We were not to be dis­ap­poin­ted. Bryan was to take us on a jour­ney through a career span­ning fifty-five years and, in so doing, remind us of a world before Meadowhall and Leisure Centres: of com­pan­ies, products and places now in many cases no more (but not for­got­ten). At times we could almost sense vibra­tions from the forges, sniff the smoke of pol­lu­tion and inside, machine shop cool­ing liquid, see the sparks flying from grind­ing wheels and feel the heat of the fur­naces. It was a world where men, typ­i­fied by Bryan, worked their way up and acquired skills and know­ledge through appren­tice­ships and prac­tical exper­i­ence. Having com­pleted his edu­ca­tion at Owler Lane Technical and Abbeydale Grammar School. Our speaker’s career com­menced in 1958 when he joined, aged 17, Brown Bayley as a Works Trainee. The firm, based on what became the Sheffield Arena site, at the time employed over 3500 employ­ees. It pro­duced a wide range of both fin­ished products -such as rail­way tyres –to spe­cial­ist sheet, ingot, rod and bar steels which provided the raw mater­i­als for everything from the aero­naut­ical to sur­gical instru­ment indus­tries. Brown Bayley proved to be the ideal com­pany to train, provid­ing a solid found­a­tion for his future career. Over the next six years under the care of Harry Kelford — Training Manager Bryan gained, in six month stints, expos­ure to each of the main pro­duc­tion pro­cesses and to the metal­lur­gical labs (where there was a large pic­ture of Harry Brearley to inspire) test house and creep test­ing lab. He con­tin­ued his edu­ca­tion through day release and even­ing classes, study­ing metal­lurgy at Sheffield Tech. It was Harry Brearley who set up the Freshgate Trust in 1941. Bryan won a place on it in 1963 and vis­ited Mannesman and Mercedes in Germany. In 1964 Bryan was pro­moted to assist­ant to the Chief Inspector, work he found inter­est­ing but his aspir­a­tion was a career in sales. 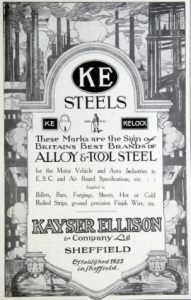 In 1965 Bryan joined Kayser Ellison & Co to sell tool, high speed, stain­less and engin­eer­ing steels. This was to be his start in tech­nical selling and valu­able fur­ther exper­i­ence. The Company had a strong repu­ta­tion for its tech­nical assist­ance to cus­tom­ers in such areas as alloy selec­tion and heat treat­ment.. In 1966/7 He helped to set up a new ware­house for KE in west London which pro­cessed, stocked and dis­trib­uted tool steels to this import­ant and grow­ing market with its con­cen­tra­tion of spe­cial­ist man­u­fac­tur­ers. In early 1972 KE formed a group sales team. Bryan was expec­ted to sell fin­ished products as well as steel. He had to handle an inquiry for hack­saw blades and files for the work­shop in a large regional prison. One prob­lem: the cus­tomer spe­cified that his order should be packed in saus­age rolls! Deciding that selling fin­ished products was no longer for him, Bryan seized an oppor­tun­ity later in 1972 to join Detroit based Rolled Alloys Inc , major sup­pli­ers of wrought heat res­ist­ant alloys (espe­cially for applic­a­tions in the 600‑1200 degrees C range) to the US car industry. After six weeks train­ing in America, He became “their man” in UK and Europe. Over the years, ware­houses and offices were to open or relo­cate as the busi­ness expan­ded. The com­pany was to enhance its repu­ta­tion as a pro­vider of tech­nical advice and solu­tions. In 2000 Bryan left his facil­ity man­age­ment pos­i­tion to work dir­ectly for the owners who had plans to grow the busi­ness in Europe and SE Asia by acquir­ing other com­pan­ies and new start- ups. Locations were to stretch from the UK to Singapore. Bryan’s activ­it­ies mainly centred around assist­ing with acquis­i­tions, train­ing new sales staff, resolv­ing prob­lems in com­pan­ies that had been acquired and giving tech­nical present­a­tions at con­fer­ences. In the later stages of his career Bryan began to spend more time in areas where the present was giving way to the future. Power gen­er­a­tion and waste incin­er­a­tion were present­ing inter­est­ing tech­nical prob­lems and busi­ness oppor­tun­it­ies. We were shown illus­tra­tions of examples of these. A cus­tomer in France called one day to ask about alloys for use in equip­ment for the incin­er­a­tion of an inex­haust­ible supply of goat’s dung! 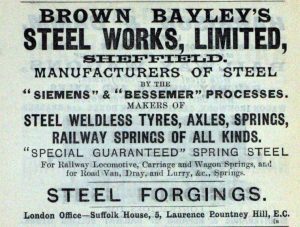 In 2013 Bryan gave a paper on nickel alloys at the Harry Brearley Centenary Conference held at Sheffield University. Now at the age of 72 and after over half cen­tury in the spe­cial steels busi­ness, retire­ment was beck­on­ing. Having star­ted his career under a pic­ture of the great man Harry Brearley this seemed as good a time as any to call it a day on a fas­cin­at­ing career. It was a story of which mem­bers much enjoyed as clearly shown by the range of ques­tions and obser­va­tions made at the con­clu­sion of a most inter­est­ing and enter­tain­ing ses­sion.